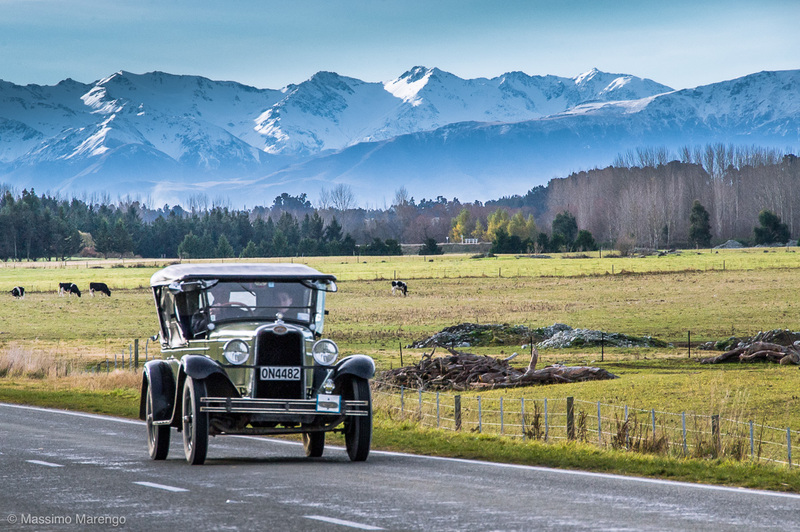 While New Zealand cars are the same as in any other country (apart for the steering-wheel on right side), I met there an unordinary number of cute old cars. The day I was touring the Inland Scenic Route 72 (which is actually passing by route 77 and 73 also) I met a procession of these restored jewels leisurely driving around. Well, not a real procession: I found them in separate places, seemingly driving in random directions. I counted at least 20 of them, all driven by ladies and gentlemen with a costume matching the same epoch of the car. 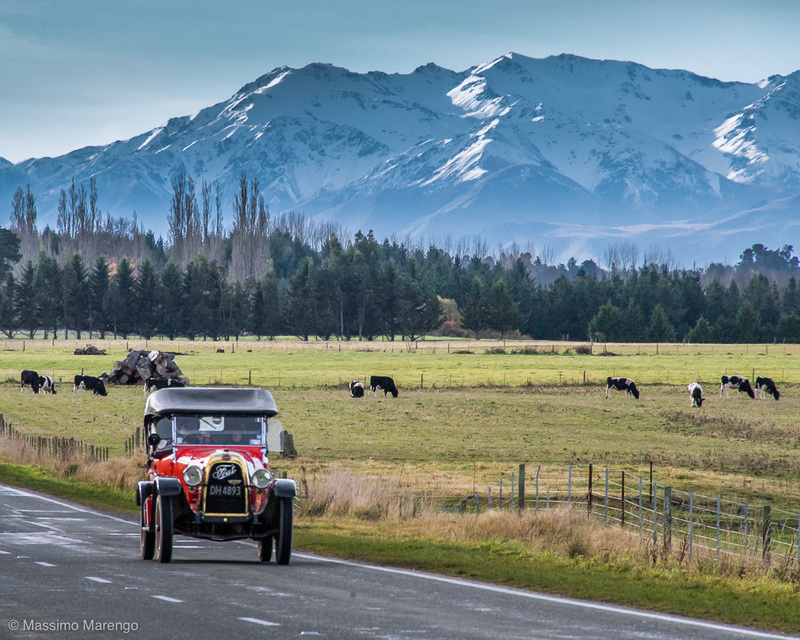 On my way back to Christchurch I found them again on an open stretch of road, with the superb snow capped Southern Alps as background. 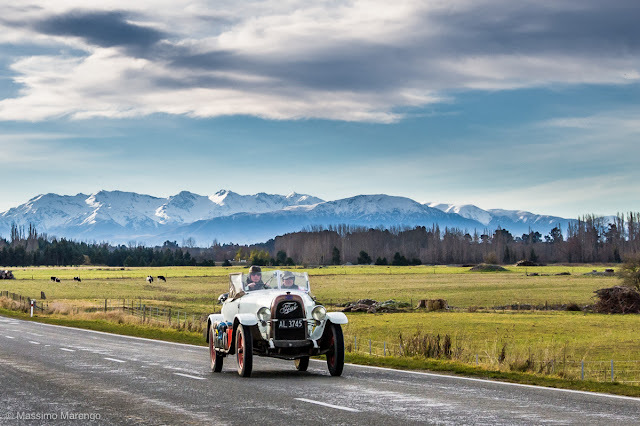 Writing about old cars reminded me of the New Zealand roads. I was quite impressed by them, and by the amount of maintenance that is continuously done to keep them in prefect shape. In our 3,000 km of driving we found work crews everywhere, patching the pavements, enlarging the width of the roads, repairing their sides. 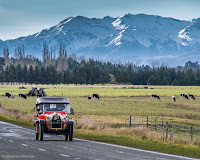 Even though the South island is sparsely populated, it has a huge touristic traffic in summer and during the skiing season, when the pavement suffers from the ice and snow of severe winters. Despite all this abuse all the roads I saw were really well maintained, without the continuous litany of potholes and cracks so typical in the US (and Italy... and Venezuela, just to mention the countries I know best). The only perplexing thing is that most of these roads, whenever they had to cross a body of water, be a large river or a minuscule stream, have narrow bridges where only one car can pass at one time. You have to stop, check that nobody is coming from the other side, and then cross. These one-way bridges are also along main roads, which I assume in summer must have quite a lot of traffic. Still, driving on those roads was a real pleasure and great fun (as long as one remembers that “left is good”). Leisurely driving along these roads was probably the best part of our New Zealand vacation. We really didn’t plan the trip. We decided beforehand which parts of the Island we wanted to see, and we drew a rough itinerary based on the number of days available. But we allowed ourselves to change the program any time we liked, based on how much we wanted to drive. We never reserved in advance. True, it was low tourist season, but we never had any problem in finding the bed & breakfast or motel where to sleep, even arriving past dinner time. So we just drove at our leisure, stopping all the time I wanted to take a picture, spending time sitting in cozy coffee places we found along the way, making last minute deviations just because “the road looked nice”. I generally drove quite slowly enjoying the landscape, which generally didn’t drive the locals crazy as they were also going around without any hurry. Arriving late often meant reduced dining choices, as restaurants generally closed their kitchen quite early. Pubs were however serving fish & chips until late, and this was our main food for the entire trip (and the beer was very decent too).